I went to Providence this weekend to the Interbike East gear demo & Providence Cyclocross Festival. What a fantastic day! The CX course was very technical, and all sorts of talent was there trying their skills. It was set up in Roger Williams Park, with most of the trail in plain view of everyone - very nice to be able to see multiple action points from just one spot! In addition to the cross racing, lots of bike companies had tents set up to show their wares, many with demo bikes available. 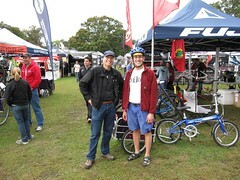 I met "Masiguy" Tim and tried one of his steel Masi cyclocross bikes. I also rode a high-end Felt with top-of-the-line SRAM transmission - it took me a while to figure out the "double-tap" shifting! When I made it to the Breezer tent, I was intrigued by the new MTB offerings. Joe Breeze was one of the original mountain bike guys in the 70s, and he's since done immeasurable good for the bike commuting world with his line of commuter and comfort bikes. So it was great to see the company going back to its roots. When I mentioned this to one of the guys at the Breezer tent, he said "There's Joe now, you can tell him about it!" So I had a great chat with Joe Breeze! Very nice guy indeed. Then I rode one of the mountain bikes, which was sublime. The try-out course, by the way, was a delight. A great combination of grassy flats and technical singletrack - not without hazards! A fantastic day all around. After the fantastic time I had with the family this summer in the Berkshires, I knew I'd try to come back soon. I didn't even guess that it would be for work! We developed a custom your for a group from New York, and I'm driving the support car! I got to Lenox this afternoon to check over the bikes and get the car all set up, then I met most of the group and adjusted their bikes for them. All very nice and agreeable, excited for a great weekend. The weather report is a little grim for tomorrow, but no one seems too daunted. The other guides and I spent some more time after the bike fitting going over the plans and routes - everything looks great! We're doing lots of the same routes I explored when I was her last time. Even if tomorrow is a little wet, Sunday and Monday gave lots of potential. Of course, I hope to get some riding in myself at some point... Maybe crack of dawn on Sunday or Monday? Or maybe after lunch on Monday.